Thank you! We want to express our delight, you made a difficult process very smooth, seamless and easy. I have only positive things to say about Winsor Homes. I would build another house with Dave without question. I’ve done three houses with him in the last 20 years…Just finished another one this past fall. Thanks for a great job. Mr. Picky (Ross) was very impressed at the great workmanship. Many thanks! The house is wonderful and we absolutely love it!!!! Thanks so much for everything!! Our house is coming along great! Just love it and (we) have told all of our friends about you. The house is Great! We are very happy with it....thanks for everything. 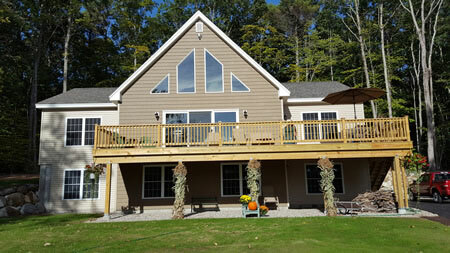 My husband and I had an excellent experience with Winsor Homes in Meredith to build our chalet in Canterbury. We chose Winsor Homes after reviewing their website and meeting with them. Bonnie was a joy to work with to design our home and is extremely knowledgeable about all of the product choices available. We chose a rather difficult site to place our home, but Dave had no issues at all with setting the house exactly where we wanted it. All of the subcontractors that Dave used did exceptional work and were very professional. Our project went very smoothly from start to finish and was completed within the timeframe specified at the start. There were no surprises and the staff were very responsive to our communications. We highly recommend Winsor Homes to build your new home and would use them again in a heartbeat. In fact, we will be working with them again in the future to do additional work on our home. We had an excellent experience building our home and are very glad we chose Winsor Homes. It has been a pleasure working with you on our new home. We absolutely love it and can’t wait to move in next week… Thank you so much for everything. We will highly recommend you to anyone wanting to build a house. Your company is wonderful to work with and made our experience a great one. You’re the best!!!! We want you to know how pleased we are with the house. The quality of construction and finish work is impressive. We certainly appreciate the time you took to guide and work with us on design modifications, assistance obtaining permits, providing timely updates throughout the entire project and coordinating the work of subcontractors. We are very pleased with the finished home and the “aging in place” decisions that should meet the needs of our family. We greatly appreciate the time and direction Bonnie provided us in those initial months of exploring options. From floor plans to cabinets; roofing, siding and accessibility considerations...Bonnie was patient and worked with us to explore possibilities until the best solution was agreed upon. Dave’s suggestions for window placement; front door enhancement; and the (on site) garage to blend with the (on site) covered porches as well as the home added the visual quality that blended lifestyle needs with the site. I just want to say a big Thank You to Dave for coming down and taking care of the minor issues at our home. Thanks for taking such good care of us! We want to take this opportunity to thank you for the beautiful job you did designing and building our house! We absolutely love it!! The quality of your work was top notch! Friends, neighbors, and even passerby’s have stopped by to compliment everything from the design to the exceptional workmanship of this house. You made our building experience very pleasant, and we now have a lifetime of beauty to enjoy as a result. Bonnie, we want to thank you for the countless hours you spent with us on the design, layout, interior colors and schemes, and for your prompt and courteous responses to our email messages and phone calls. I can’t put a price on the time you have given to us, the advice and responsiveness. Dave, we want to thank you for the terrific structural design advice and execution; your hard work on the site and your exceptional choice and coordination of services and quality trades people. We continue to be amazed by the outstanding service you and your staff provide to your customers. You built our house 4 years ago and at that time your entire staff was informative and extremely helpful. Bonnie and Nancy were a pleasure to work with and available to answer any questions throughout the building process. When we had some minor settling of the house during the first year, your staff was eager to take care of us and the cracks were repaired. Now, 4 years later, we noticed a problem with our basement. Again you took care of us by making a fix to the sliding door frame and resolving the problem. We have had numerous compliments on the house and tell everyone what a good job you did and how pleased we are with the results. 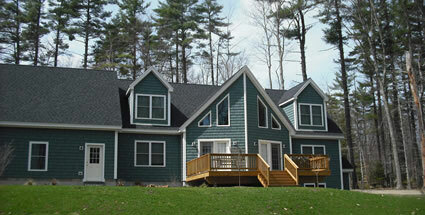 You provided a quality home with excellent workmanship on the finished product, and you stand behind your work. 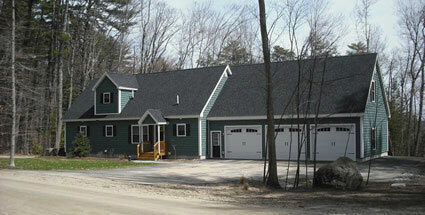 We recommend you to anyone who mentions building a modular home in the Lakes Region. Thank you for taking care of us yet again. Thanks for helping us design and build our beautiful new home. We are very pleased with the quality construction and would recommend Winsor Homes to our friends. It was a pleasure working with you and thanks again. Just a note of thanks for going beyond the call of duty. It is greatly appreciated, as my experience working with some has not come close to my experience working with Winsor Homes. You are trustworthy and totally professional and the workmanship is beyond my expectations. …..Also I’ll be contacting you sometime in the future for a quote to finish the second floor. Thanks Again. Everyone who comes inside comments on how spacious the house feels. We are so happy with it, we really hate leaving on Sunday nights. If someone is looking for a reference, don’t hesitate to give them my name. The process was smooth… All in all, I’d do it again. A lot of people that do new construction say they would never do it again. Both you and Nancy are great at hand holding!!! Just to give you a "heads up" - have new neighbors moving in and they were here today and we gave them the "grand tour" - very interested in Winsor Homes - they are looking for something slightly smaller than ours (2 bedroom) - needless to say, we told them you were the best! - gave them your name/address/phone. Pat J. 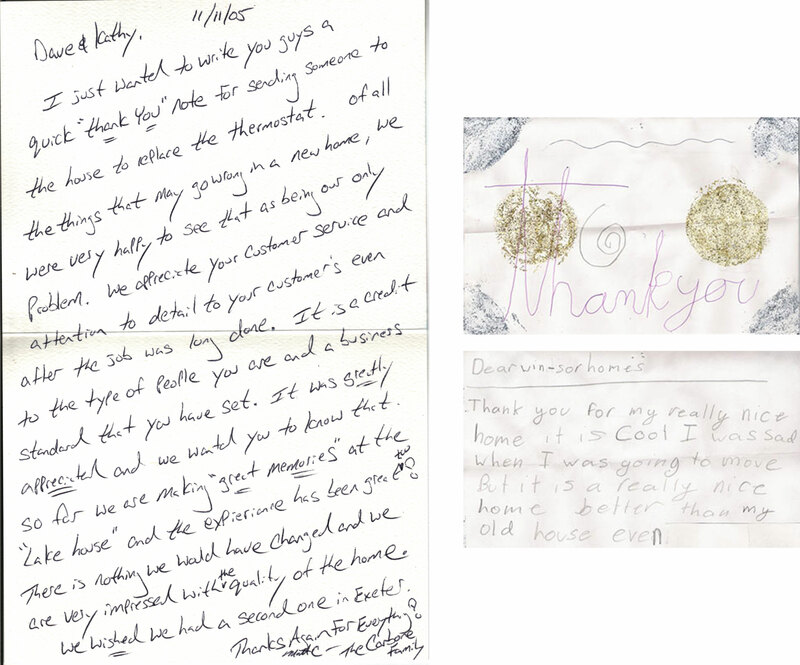 & Carole W.
We wanted to express our sincere thanks for your help in building our new home. We absolutely love it and can’t tell you enough how much we appreciate your willingness to make our home perfect. We are truly grateful for all you have done for us. You made our dreams come true. We love our new home. You made us feel like part of your family. Thank You! Thank you very much for all your help and our wonderful new home. We want to thank you for making the process trouble and worry free. Everything went very smoothly and we can’t thank you enough for that. Thank you for making the experience a positive one. If we ever decide to do it again, we know who we will call. Thanks for your great service and care with our new home. You all have been wonderful to work with. Thank you! The more time I spend in my new home, the more I love it. The house is warm and tight. Heating bills are low…I love everything about it. Thank you all for helping us with our new home. From start to finish, the whole thing went great. We love the house. It is exactly what we were hoping for and the quality of the home is excellent. Your help made the whole process a lot easier. Allan, Lisa & Cody P.
We absolutely love our home. Thank you so much for making my experience of building my home such a positive one. This home is beyond what I dreamed. We love our new home very much. We are glad that we chose your home. It’s super. Have had a lot of people looking at it & they all loved it. The guys have done a “spectacular” job for us and thanks for your help when I’ve called you when I needed something tended to. Thank you so much for all your support, help, expertise, advice, etc. during the construction of our home. We are very happy in our beautiful new home. Kristy V. & Dan D.
We want to take a minute to thank the entire team at Winsor Homes for a wonderful home buying experience. Through the entire process from laying out the floor plan to final sign off, everyone we spoke with or dealt with was extremely pleasant and professional. The quality of workmanship was second to none in the industry! We love our home and you have our sincere gratitude and appreciation for all you’ve done for us in such a short time. This home is so comfortable! What a great place to wake up and have breakfast. You have a wonderful product in addition to having the most helpful and pleasant office personnel, carpenters and electricians who did a great job. It is a nice feeling to know that if there is a question or problem, you are most helpful and good to do business with. It’s been almost two years since we began this “adventure”. We planned, we prepped, we faxed, craned the house and eventually moved in. Everyone was pleasant, polite and professional. We are happy with our new home and satisfied with Winsor’s performance. Should we ever have the need to do so, we would not hesitate to contact you again as well as recommend you. Thank you for a job well done on the house. We are really enjoying it. Most guests can’t believe the quality of the house. We have been passing your name along. Thanks for going beyond the call of duty. It is greatly appreciated as my experience working with some has not come close to my experience working with Winsor Homes. You are trustworthy and totally professional and the workmanship beyond my expectations. We appreciate your customer service and attention to detail to your customers even after the job was long done. It is a credit to the type of people you are and a business standard that you have set. We are very impressed with the quality of the home.